Please feel free to ask me any questions. My contact info is under the "Contact" tab on this website. Kids go quickly and I work off a "First-Come First-Serve" basis. To lock-in your preference of kid; I ask for a $100 nonrefundable deposit. Deposits are preferred by Paypal (friends and family). Paypal payments can be made to the same as my email address. As many of you know, Eveland Farm and W4 Caprine are separate herds. Eveland Farms belongs to my mom, Carol. I, Julie, am her daughter and own W4 Caprine. We both enjoy helping each other and watching each other's herds develop. I do the updating on both websites. I want to take a little bit of time to brag on this particular solid brown buckling. He catches my eye every single time I go into my mom's barn. He has Sire written all over him. I know a lot of you are looking for color, moonspots, blue eyes, ect........BUT DO NOT let this buckling go without notice. Above, you can see the udder his mother his feeding him on. This is a dam-raised udder....no pre-fill. She is capacious and raising two very nice bucklings. This solid buckling's twin brother will sell on unique color alone....but this brown boy will not disappoint in any herd. He is the real deal with plenty of milk and correctness in his background. Retained by Tami Hindman! Many thank you's for your purchase! Thank you Jessica Gipson For your Purchase of this handsome Roan boy! Thank you Roxanna for you purchase of this beautiful doeling! Thank you Kathy Naylor for the purchase of this sweet pretty girl. Asking $175 Thank you Kelly Akers! We are thrilled you are taking this sweet girl! I'm going to take a moment to brag again on mom's goats. Here again is an opportunity to have a quality herd sire. This buckling is out of a finished Champion milking doe that has proved herself time and again. He stands out in the pen! Look at his width, extension, and breed character! His Sire has earned a Reserve Jr. Championship in the show ring as well. Sire's son last year at WCC, was not only Jr. Champion, but Best in Show. This buckling has style, show ring appeal, and will make daughters who put lots of milk in the bucket. He may not have flash and moonspots, but don't buy on bling alone....buy a buck that already comes from genetics that have already proven themselves. I've milked his dam and his granddam on his Sire's side.....they produce and are easy easy milkers. Pictured above at only 10 days old. This guy will have a bright future and is already wanting to be friendly. Thank you Tami Hindman for your purchase! Thank you Jessica Gipson for your deposit on this beauty! Sold to Tami Hindman. Thank you! Thank you Jessica Gipson for another deposit on another pretty girl! We thank you! Asking $450 Thank you to Tami Hindman for your Retainer! Thank you Megan Neuharth for your Deposit on this Wildly beautiful girl! Thank you Courtney DuCharme for the purchase of this wildly colored boy! 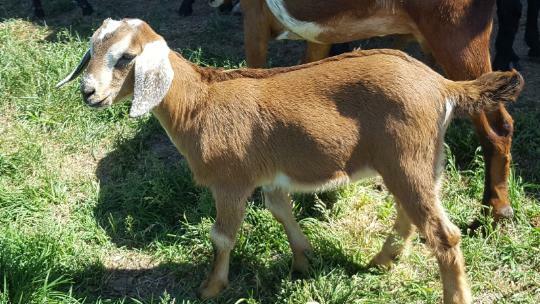 Sire: "Backyard Mini Nubian Arnold Blue"
The above doeling is Blue-Eyed! She is horned, but disbudded. Deposit place by Kelli Akers. Thank you for your purchase! Above buckling is moonspotted, polled, AND BLUE-EYED! Deposit made by Roxanna! Thank you for buying from us multiple years! Hayzel delivered our first set of QUADS! Four healthy babies and she is dam-raising them without assist or supplement. Good Girl Hayzel! Above: Doeling Reserved by: Jessica Gibson.Thank you for your multiple purchases! Thank you Julie Glenn for your deposit on this special gal! for sale as a pet. Doeling on the left retained; bucking on the right. AnnaBell 1st generation twin bucklings.